The term “six schools of the southern capital” 南都六宗 refers to the mainstream and officially recognized Buddhist schools that flourished in the capital Heijō-kyō 平城京 (Nara) during the Nara period (710-794) in contrast to the “northern capital” of Heian-kyō 平安京 (Kyōto). These schools were officially patronized by the Nara imperium which had earlier adopted a Chinese model of centralized government and well-organized bureaucracy which oversaw many aspects of civil society, including Buddhist institutions. As in Tang China (618-907), the government supervised ecclesiastical activities and saw the utility of using the religion for the purposes of social unification in a period with many disparate loyalties. However, Buddhist institutions received ample funding and consequently scholarship flourished. Whereas these two were more practice-oriented, the six schools are now understood as having been more scholastic and only accessible by a minority of literate clergy with access to the relevant materials and resources. Being sponsored by the state also meant the scholars were tied to the court and its interests. All of these schools stand in contrast to the popular Pure Land and Nichiren movements during the Kamakura period (1185–1333) which were highly accessible to common folk. - Sanron-shū 三論宗. The “Three Treatises” school, or Chinese Madhyamaka school which focused on three key texts: the Middle Treatise 中論 (Mūlamadhyamaka-kārikā), Twelve Gate Treatise 十二門論 (Dvādaśa-mukha Śastra), and Hundred Verses Treatise 百論 (Śata Śāstra). - Jōjitsu-shū 成實宗. A school focused on the study of the Satyasiddhi Śāstra by Harivarman (c. 250-350). - Hossō-shū 法相宗. The Chinese Yogācāra school. - Kusha-shū 倶舎宗. The Chinese Abhidharma school, especially focused on the Abhidharmakośa-bhāṣya by Vasubandhu. - Ris'shū 律宗. The Chinese Vinaya school with particular emphasis on the practice and exegesis of the Dharmagupta Vinaya 四分律. - Kegon-shū 華嚴宗. A school dedicated to the study of the Avataṃsaka Sūtra. These largely represent the prevailing intellectual Buddhist currents that were mainstream during the early to mid Tang period (618-907). 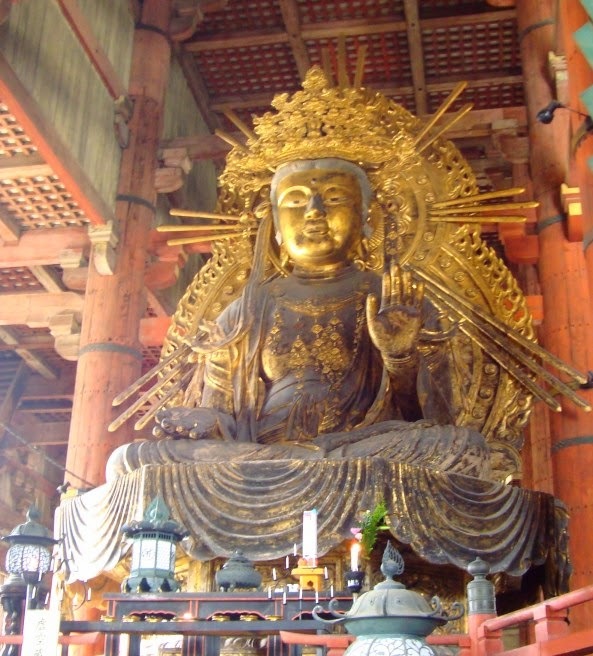 The Japanese adopted Buddhism through various channels, at first through contacts with Korean kingdoms. In particular was the Yamato court's ally Paekche (for details see here). Japan is unique in East Asia for having remarkably preserved the material and intellectual components of these six schools. Physical specimens such as handwritten manuscripts, temples and statues dating back to the Nara period are readily visible in Nara today (see here). Japan also preserved many manuscripts that were lost on the mainland and only later recovered. The term rendered “school” here was initially represented in Japan with the Chinese character shū 衆 (assembly), whereas after around the completion of the Daibutsu 大佛 at Tōdai-ji 東大寺 in 752, the character shū 宗 (sect) came to be employed. The essential difference was that the former was a gathering of scholars committed to common research whereas the latter reflects more exclusive ecclesiastical communities. In general multiple communities could reside within the same temple, whereas from the Heian period it tended to be “one temple, one sect”. Saichō 最澄 (767–822) consciously detached himself from Nara to build his own exclusive Tendai school based on Mount Hiei, a topic which I explored in an article Saichō's Monastic Reforms. His contemporary Kūkai 空海 (774-835) likewise formed an exclusive new tradition, however Ryūichi Abe does state "that at the heart of Kūkai's effort to disseminate Esoteric Buddhism in Japan was not the establishment of a sect but the creation of a new type of religious discourse grounded in his analysis of the ritual language of mantra. "2 Nevertheless, Shingon did develop into multiple exclusive sects, and Heian period Buddhism is characterized by a sectarian consciousness which was only amplified in later centuries. One work I recommend reading is The Essentials of the Eight Traditions 八宗綱要 by the monk Gyōnen 凝然 (1240-1321), which has been translated by the Bukkyō Dendō Kyōkai (see here). The work introduces in appropriate detail the six aforementioned schools plus Shingon and Tendai. 1 There is early mention of “five schools” which excluded Kegon. For example, in 718 there is a government document which mentions “five schools” and the “teachings of the Tripiṭaka". See 世界大百科事典 第２版の解説. 2 Abe Ryūchi, The Weaving of Mantra: Kūkai and the Construction of Buddhist Esoteric Discourse (New York: Columbia University Press, 1999), 4.